May 2015 n Performance & Hotrod Business n 49 Owning a fire truck is not a mem- bership requirement. Many SPAAMFAA members simply appreciate historical fire trucks. 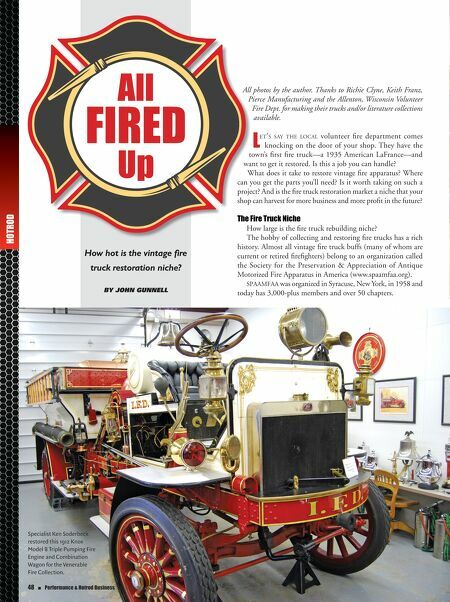 There are SPAAMFA members who own dozens of old fire trucks and there are members who never had the money or room to own and restore one old fire truck, but are fascinated by the history of such vehicles. There are owners of old fire trucks that don't belong to SPAAMFAA or to any antique truck club. Clubs appeal mainly to those who own very specialized, pur- pose-built fire trucks. However, there are many pieces of apparatus—especially early ones—that did not leave the factory as fire trucks. Many were standard trucks that were converted to firefighting vehicles as villages and small cities across the country switched from horse-drawn apparatus to motor trucks. When it comes to restoration work, there is a big difference between a regular Ford, Chevy or Dodge truck with firefight- ing equipment added and a big Seagrave or American LaFrance fire engine that was made specifically to battle flames. Any res- Be prepared for special- ized requirements like brass plating and gold leaf ornamentation if your shop restores a truck like this 1925 FWD Model J. 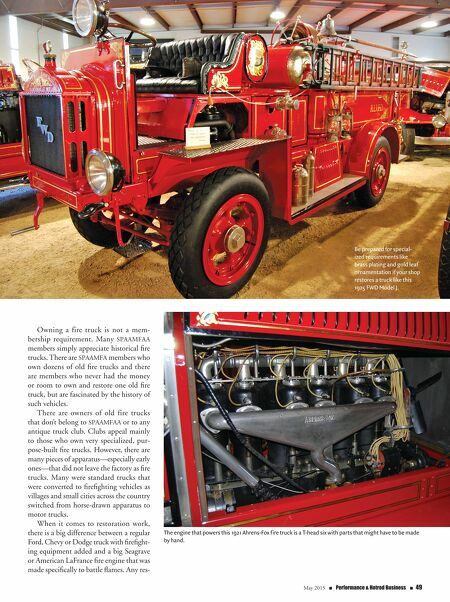 The engine that powers this 1921 Ahrens-Fox fire truck is a T-head six with parts that might have to be made by hand.